I’m seriously considering moving the blog to a dedicated server of its own. I already have one set up, and have been using it to host the pics for the blog for years now. The only reason I didn’t move the blog there fully was that, by the time I had it up and running, a lot of people were reading it here on the WordPress-hosted site, and I didn’t want to inconvenience my readers. However, I’m pretty bloody annoyed that I was given no warning of this. The ads have, apparently, only appeared very recently, and they were completely unannounced. Apparently, every WordPress-hosted blog now has them, so if you have a blog of your own it might be a good idea to turn off AdBlock (if you’re using it) for a while to check them out and maybe make a post explaining to your readers why the heck you appear to be trying to make money off them all of a sudden. It’s only because a good friend of mine asked if I was making any money from my Google Adwords on the blog that I realised they were here at all! For those of you using Firefox, I highly recommend the AdBlock extension. Chrome users can use the excellent AdThwart extension. December 9, 2010 - Posted by	Mar | grrr! For what it’s worth, I am with you. But hosting a website is not the expensive enterprise it used to be. I use Dreamhost. I pay $10.95 a month. And (here’s the evil part) I can charge to host other web pages. I usually just ask for anything that is out of my pocket, such as domain registrations or transfers, and accept donations. Agreed on the price of webhosting. I’ve been with Dreamhost for a while now (I was originally going to host the blog there anyway) and their prices are extremely reasonable for the storage and bandwidth that they offer. 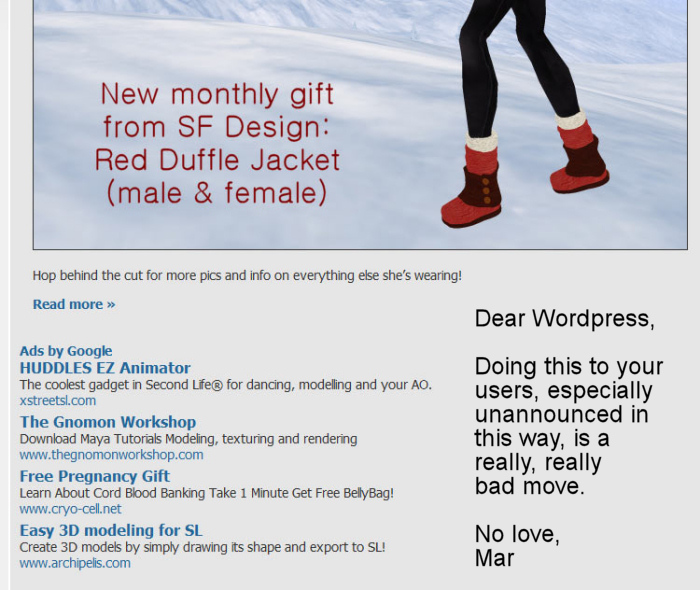 My main gripe is with the sneaky way WordPress went about this. They’re all for publicising the nifty, fun stuff they offer, but something like these ads gets snuck in under the counter and makes people like me look bad. 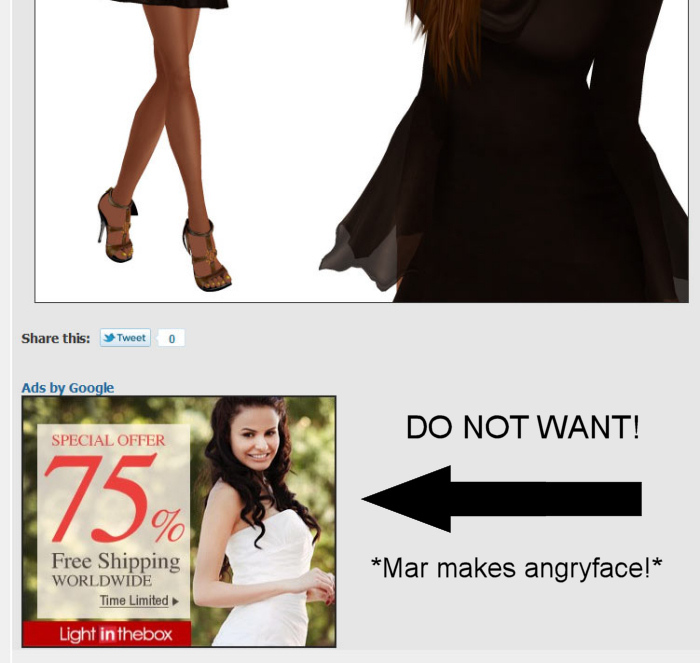 Especially on a blog like mine, where the whole ethos is primarily living in SL on the cheap. It’s as though I’m poking my readers to subsidise my SLife while preaching at them how they can save money! Agreed. I have been a WordPress Fan/Guru since the Before Time. I mean like 1.0 time. And it was simply inevitable that the wp.com site would start to monetise. WordPress is now in the big time, and that is just how it works. Would have been nice to be informed, though, or given a premium option to opt-out.